Originally posted: April 3, 2017 . Last modified: March 18, 2019 . Our sweet n tart key lime cheesecake dip has fluffy whipped cream cheese infused with tangy key lime juice to make the ultimate dipping dessert. Okay, gals and guys, be gentle. Today marks my first official recipe posting with almost no assistance. Usually, Kim and I split up the work, so one person doesn’t get overwhelmed. However, Kim is a hard-working wife, and she deserves a break from time to time. So, I took the liberty of doing almost everything for today’s post. I prepared the cheesecake dip, staged the photo shoot, and even took the pictures. Kim still did the editing on the pictures, but that was it. The rest was all me. Now that you know why something is “off” about this particular recipe, we can get down to business. This dip is perfect for parties or a fun family dessert. There are only a few ingredients and preparing it is a simple process. It uses fluffy whipped cream cheese, vanilla, powdered or confectioner’s sugar, sour cream, and key lime juice. The graham crackers are for dipping and sprinkling over the top of the dessert. I wouldn’t recommend mixing the ground up crackers into the dish as they might become mushy. The flavors are a mixture of sweet and tart and texture is creamy. You can pull the cream cheese out in advance, but it’s not necessary, it mixes just fine straight from the fridge. How about we get started? Start by grinding up the graham crackers in a food processor for the garnish, if you decide to use them. Next, in a stand mixer or using a large mixing bowl and hand mixer, combine the cream cheese, powdered or confectioner’s sugar, vanilla, sour cream, and key lime juice. Mix the cheesecake dip on low to start for approximately 1 minute. Do I really have a reason for this? Well, I found that by adding the extra minute on low, it seems to make the dip creamier. After the minute has passed, turn the mixer up to medium and continue blending the dessert for another minute. It should be fluffy looking and smooth. It won’t look like whipped cream, but the texture should at least look light and airy. At this point, if you choose to, you can add a little green food coloring and mix it in with a spatula. I did it for the pictures. Otherwise, I would have had, even more, lighting issues. I have made this dip 2 more times and left out the food coloring, so it’s entirely optional. Whether lime green or not, the dip is basically done. Remove it from the mixing bowl and transfer it to a dish. Once we had garnished it with ground crackers, we used the remaining graham crackers for dipping, but you can be creative and use whatever you like. The dessert will easily serve 6 people and can be stored in your fridge for up to 3 days in a sealed container. As always, I wish you a long, healthy life, love everlasting, and a tummy full of delicious food. Want even more key lime recipes? Then take a look at our Fruity Pebbles Funfetti Cupcakes with Key Lime Buttercream or our Key Lime Fudge! If you like this key lime cheesecake dip recipe, please leave us a comment and rate the recipe card. You can also find us on Facebook, Pinterest, Twitter and Instagram searching for Berly’s Kitchen! Grind the graham crackers using a food processor. In a stand mixer or using a mixing bowl and hand mixer, combine cream cheese, powdered or confectioner's sugar, vanilla extract, sour cream, and key lime juice. Increase mixing speed to medium and continue blending dip for an additional minute or until mixture is fluffy and creamy. Fold in green food coloring if you choose to add it to the dessert. Sprinkle the dip with ground graham crackers and serve with remaining graham crackers for dipping. Calorie count is for the dip and does not include the additional graham crackers for dipping. Dish easily serves 6 people and can be stored in your fridge for up to 3 days in a sealed container. Oh my this sounds amazing I have never had cheesecake dip! Thanks for sharing I will be trying this recipe this weekend yum! This is so unique! And it looks delicious! I love cheesecake dip! Key lime? It’s like mixing two of my favorite things!! This is the perfect summer treat. Thank you, Jessica! We feel the same way about cheesecake and key limes 🙂 Glad you liked the recipe. That looks really good! I must try this. This sounds sooooooo good! I love key lime and cheesecake, so I definitely want to make it! Thank you! Don’t be hard on yourself – I think your first solo post looks amazing! And the dip looks great too! This sounds like a great idea! I love sweet and tart together. Plus key lime is one of the best flavors you can get! Thank you, Krysten! I agree, sweet and tart is an awesome flavor combination; like sweet and sour chicken. Have a wonderful day! OMG this looks amazing. I want to try this. This looks delicious! I LOVE sweet dips like this. I’m going to have to try it soon! I think that dessert dips are the best thing ever! This sounds so yummy- I can’t wait to try it. Thank you, Cori! Before this dip, Kim and I weren’t too crazy about the idea of eating a sweet dip. However, this dip proved us and wrong and I couldn’t be happier 🙂 I hope you enjoy it! Oh my! This dip looks incredible. you had me at the combo of cheesecake and key lime! You had me at “Key Lime”…I just love, love the taste of Key Lime Pie. I never would have thought to make it a dip. Can’t wait to try. Thank you for commenting! Key lime is one of our favorite flavors. I think it’s the real reason Kim went along with moving to Florida lol! I hope you love it when you make it 🙂 Oh, if you like key lime, check out of key lime fudge. You may like it too 🙂 If not our recipe, then someone else’s recipe, it’s just too tasty to pass on. Yum! I pinned this! Can’t wait to try it…a perfect spring into summer treat! This is such a fun dessert idea! Since Key Lime is one of my favorite kinds of pie, I’m thinking this dip is something I need to make very soon. Thanks for sharing! Thank you, Cait! I seriously think key limes are why Kim agreed to move to Florida lol! Believe it or not, one of the best slices of Key Lime Pie came from the Crown Royal in Miami, FL by MIA International Airport. I stayed there during the transfer process for an old job. The chef made a pie that couldn’t be beaten. Kermit’s of Key West has the second best Key Lime Pie. Of course, these are just opinions. I recommend traveling to both locations to see for yourself lol! Yes, please! I am a huge fan of key lime anything so this is right up my alley! I will definitely be giving this recipe a try! Thank you, Andrea! It must have been really cooling growing up there. The Keys are amazing! Kim and I love the drive from Miami to Key West. I especially love 7-mile bridge, it’s such a cool feat of engineering. I am thrilled you like this recipe and thank you again for commenting! I love how fluffy this dip looks! I want to eat it with a spoon. We went to Key West last summer and this dip totally reminds me of that trip and the drive from Miami- gorgeous. Also, yay you for posting for Kimberly. I LOVE when my husband posts for me too. And your post rocked so good job! Thank you, Jenna! I really appreciate your comments 🙂 Kim and I love the drive down US 1, it’s so gorgeous. Seven-mile bridge is so awesome. Kim works hard during the day and then comes home and works on the blog, so I try to help as much as possible. I am glad the post turned out and people seem to like my dip. All in all, I consider it a win lol! Thanks again for commenting, Jenna. Have a great weekend. This dessert would be ideal to serve at our upcoming outdoor BBQ, such a great flavor! Oh, my! This looks so mouthwatering! I’m craving this real bad btw! I’m going to give this recipe a try next week, just in time for my Holy Week Holiday. Thanks for sharing! Can’t wait to try it! 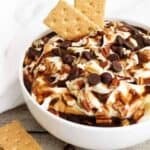 This looks yummy, it feels like the perfect summer dessert to bring with lots of kiddos around!! Thank you, Jess! The bright and fresh flavors seem to fit well with this time of the year, glad you enjoyed it! I love key lime pie! I can’t wait to make this. This sounds really interesting! My husband loves Key Lime and I bet he would really enjoy this recipe. Thank you, Rachel! Glad your husband would enjoy it, have a happy Sunday! This sounds like something that my husband and kids would enjoy having as a dip. I know I will enjoy this dip. Thank you for sharing .